LibreOffice derived StartCenter from OpenOffice and StarOffice. It lists the past 25 documents you opened. In addition to these applications, recent documents are also in the StartCenter. This tiny application acts as a central point for the office suite. Both OpenOffice and StarOffice, from which LibreOffice is derived, have StartCenters. This makes these suites like Google Drive and other office suites that you access through your Web browser. Drive lists all the documents you store on it and all the documents that you have created with one of Google’s applications, like Docs. Clicking a document created with a Google application opens it in a new tab. The list of documents \is still in the first tab, so it is easy to choose another one. StartCenter is different from the online office suites’ applications because it lists documents that are stored in various locations, not just a hard drive or server. If you opened a document from a server or a USB drive, it will be listed in the StartCenter, if it was one of the last 25 documents opened. Unlike Google Drive, it only will list the past 25 documents. Drive lists every document stored on it. Microsoft Office doesn’t have the same centralization. Microsoft Word, Excel, and PowerPoint list recently opened documents from various locations. However, these applications only list their type of documents. If you are working in Word and want to work on a spreadsheet that you edited yesterday, you need to open Excel or find the document in your Windows directory. LibreOffice’s centralization allows users to easily open another document without having to search for it or open another application. In the StartCenter, he can see the text documents, spreadsheets, presentations, and other types of documents that he recently edited or created, so it is easy for him to choose which document to work on first. The Recent Documents (or drop-down arrow for the Open icon) in the application being used makes it easy for the user to open another document and work on it. He also can easily close the new document, return to the former one, and then open the new one again. In Microsoft Office, it is not as easy to work on different types of documents at the same time or switch between two or more documents. 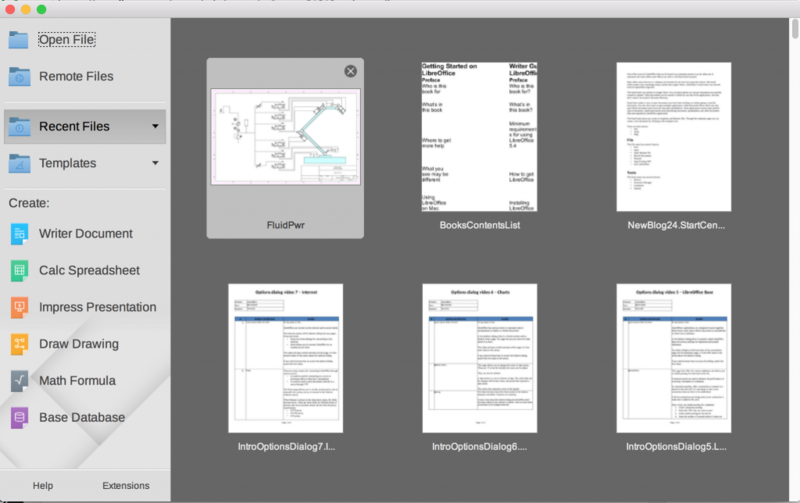 The user cannot see all the documents he recently worked on, if those documents are different types. Click the desired document from the list. The user also can use Windows Explorer to find the document and click on it. Either way, each time a that was recently opened and is of a different type needs to be opened, another application needs to be opened first, or the directories need to be searched first. Even if the user is opening the same type of document, clicking the File menu in Word, Excel, and the other Office applications forces him to leave the contents of the current document to open another document. The steps to open a recent document is the same in LibreOffice applications as it is in Microsoft Office applications. However, LibreOffice allows users to open different types of documents from the same lists, regardless of the application that the list is in. This makes it slightly easier to work with multiple documents than it is in Microsoft Office. LibreOffice can open Microsoft formats, so it could be used as a more efficient tool for editing multiple documents at the same time. Many users will find that they can edit documents faster with LibreOffice.